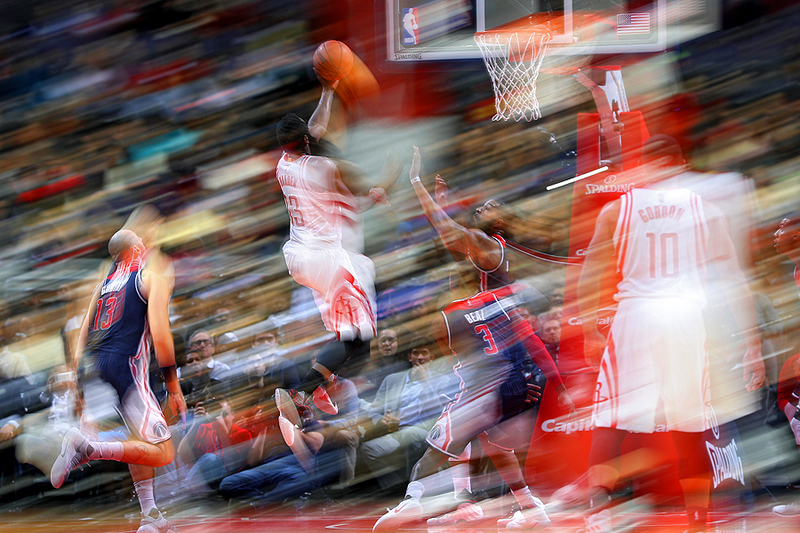 "James Harden #13 of the Houston Rockets shoots in front of Bradley Beal #3 of the Washington Wizards during the second half at Verizon Center on November 7, 2016 in Washington, DC." Every indoor arena in the United States for the most part uses strobes for still pictures. These lights are mainly used by the team's team photographer, typically for basketball and hockey. To the naked eye, fans and athletes probably don't notice the continual flashing on white light. While there are some athletes that train to play with the flashes, including Michael Jordan, photographers often have images ruined by others photographers flashes. The term is literally called 'strobed' when one is exposed properly, but catches the flash of another, and it washes out the image. However, I often try to use it to my advantage. I'll set a custom exposure and try to catch the strobe to help freeze the action with a slow shutter speed. The results vary and it's a risk, but when it works, it's a nice mix to daily coverage. 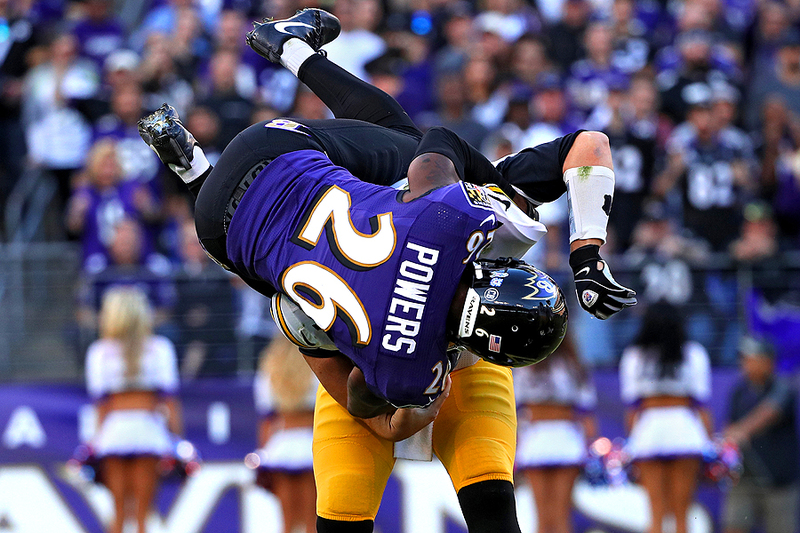 "Cornerback Jerraud Powers #26 of the Baltimore Ravens attempts to sack quarterback Ben Roethlisberger #7 of the Pittsburgh Steelers in the fourth quarter at M&T Bank Stadium on November 6, 2016 in Baltimore, Maryland." Each and every week as a photographer you never know what you'll document. No matter what the sport, when something unique happens, it occurs so fast sometimes that one cannot even process what occurred until the play ends. Last week as the Baltimore Ravens played the Pittsburgh Steelers, I saw cornerback Jerraud Powers coming around the backside of quarterback Ben Roethlisberger. As quickly as he was running for the sack, I wasn't sure if he'd actually make contact for the sack. His speed was quicker than I anticipated, and Roethlisberger also predicted the pressure. Powers ended up going head over heels to eventually pull him down. The power of the two players was something I've never seen as they battled to make a play - and the moment ended up making an interesting picture that was also telling of the game. "Alex Ovechkin #8 of the Washington Capitals celebrates after scoring the game-winning goal against the Winnipeg Jets during overtime at Verizon Center on November 3, 2016 in Washington, DC." One of my favorite places to shoot hockey from is the crash box - this is the open seating box between the two team benches. Players can literally crash into you non-stop throughout the game whether they're skating toward the goal or changing lines because there is no protective glass. Considering dangerous by many photographers - it's a huge rush. Typical shooting positions can limit you view of the ice - both because of location and the small cutout hole in the glass. But from the crash box photographers see the entire ice at all times. Thankfully I was in there in the third period when the Winnipeg Jets came into town to play the Washington Capitals. 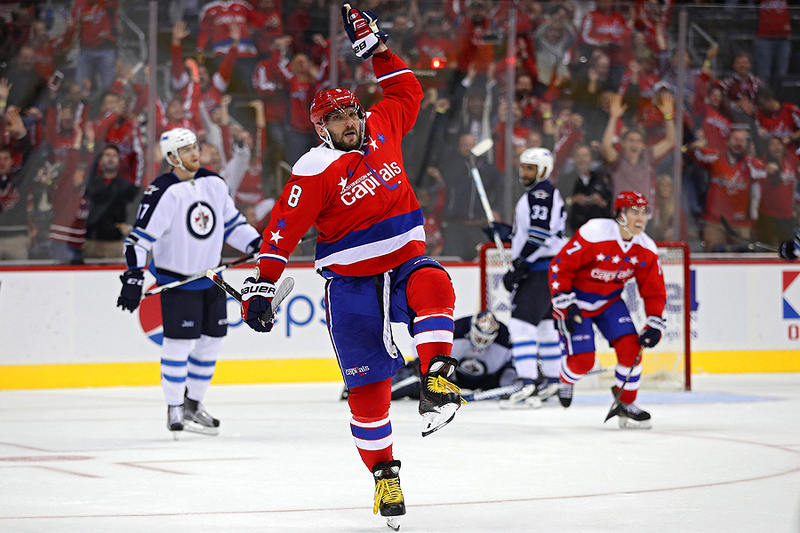 An active period with lots of goals, the game went into overtime where Alex Ovechkin scored the game-winning goal and turned back toward the bench helping capture a telling image of the night.